There are several choices available when monogramming your handkerchiefs and linens. The most common way to monogram an item is with a single letter, usually the first initial of the last name. 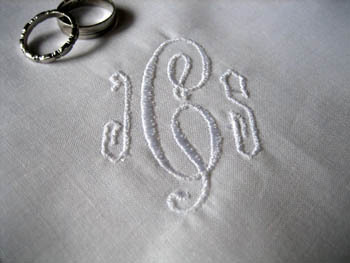 A single monogrammed letter on a table napkin for example is classic, simple and elegant. Many people also prefer to have their first, middle and last initials embroidered as well. For three letter monograms, the order of the letters is based on preference but the two most common orderings are to have either the first, middle and last or the first, last and middle initials embroidered. Married couples generally prefer to embroider the initials of the couple's first names on both sides of their married last initial. While there are hundreds of fonts to choose from, we recommend using the Script or Delano fonts. We have embroidered our own napkins, handkerchiefs, towels and pillowcases using these fonts and have achieved very elegant results. Sometimes a person will have more than one first or middle name. For example, if you are monogramming a towel for Sue Ellen Tracy Douglas, it is perfectly acceptable to monogram her initials as SETD or SEDT. Sometimes a couple will want to merge their last names when they get married. For example, if Steve Williams and Jennifer Kellerman are to be married and they want their last name to be Williams-Kellerman, their initials could be monogrammed as SWKJ or JWKS. The important thing to note when monogramming is to listen to the individual or couple's preferences when deciding on a letter sequence. There are no set rules to monogramming and in the end, it comes down making a choice that matches the personality. The placement of the monogram on a table napkin depends largely on personal preference. The most common place where initials are monogrammed are on the lower right corner or directly in the center of the napkin. For our cotton and linen napkins, we recommend using a medium tearaway stabilizer with your embroidery machine. The monogram on a wedding handkerchief is generally embroidered only on one corner of the handkerchief. We recommend a light weight tearaway or a water soluble stabilizer in order preserve the softness and delicate texture of the wedding handkerchief. Monograms on towels are embroidered differently depending on the type of towel. On hand towels, monograms are typically embroidered 2 inches above the hem or 1.5 inches above the border on the opposite edge from the label. On bath towels, the monogram should be embroidered 4 inches above the hem or 2 inches above the border on the opposite edge from the label. For terrycloth towels, we recommend using a medium tearaway with a water soluble topping. We also recommend floating the towel on top of the embroidery hoop by using a spray adhesive. For linen towels, the water soluble topping is not necessary. The placement of the monogram on a pillowcase should be centered at the midpoint of the open end and midway between the edge of the pillowcase and the hem edge. For pillow shams, the monogram should be embroidered directly in the center of the sham. For our pillowcases, we recommend using a medium tearaway or a water soluble stabilizer with your embroidery machine. We offer custom embroidery on many of our products. Please check out our line of Personalized Linens now!